This is part of the Genealympics challenges created by AnceStories and Genea-Musings in the Write! Write! Write! category. The French civil and church records are available. I found out about it last Autumn and immediately immersed myself in them. This biographical sketch comes from the records I was able to unearth on my 5th great grandmother, Marie Lassalle. She has been one of my most intriguing female ancestors because of the tidbits left behind about her in records. She was born 1739-1740 in Escou, France. Escou is located in the Canton of Oloron Ste Marie of Departmente Pyrenees Atlantiques. Her parents were Jean Baptiste de Migeu and Marie Lassalle. She had at least two siblings: Catherine and Anthoine. She was baptised on the 10 Jan 1740 in Escou, France. Her Godparents were Anthoine Lassalle and Gracie Pucheu. I have yet to learn the connection. It seems likely that Anthoine is related as her brother has the same name. She had at least one child by Luc de Bie. Catherine Lassalle was born in 1768 in Escou. Marie and Luc were not married when Catherine was born. Catherine is listed as a “fille naturelle” which means that she was not a legitimate child. It was not uncommon in this period for couples to have children before marriage in this area of Southern France. It was a common practice for couple to forego marriage until they had saved up some money. It did not stop them from having children though. Because of the commonality of the practice, the father’s name is usually listed even in church records. Luc de Bie seems to disappear from the records after the baptismal. While Marie is found in records in Escou, there is no other mention of Luc de Bie beyond 1768. Perhaps he died, though no later records list Marie as a widow. He may have gone back to his home town of Lescar. From what I can see, Marie raised her daughter alone. She never married and had no other children. By the 1780s, the French became discontented with their monarchy. The country was broke and the people were restless. The region of France that Marie was from was known for it’s noble class. I wonder how much the rebellion spilled over into the region? I know that official records end and there is a break in church records as churches were shut down. What must this time period have been for Marie and her daughter? Did they live in fear of the rebels or the nobles or maybe both? The unrest may be why Marie never married. By the 1790s, life was returning to normal. Catherine Lassalle was starting her own life. She did not marry just like her mother. She did have children though. Her first son was born in 1796. The father was Jean Pierre Bouchet. This was Marie’s first grandchild. Unfortunately, he did not survive. Catherine gave Marie a second grandchild in 1798, my great great great grandfather, Augustin Lassalle. Marie is the informant on this record which is is unusual. Women were rarely informants for events. It was normally a male relative and if they were not available a male neighbor stood in. It could mean that Marie had some standing in the community. There is no mention of a father. So, it is unclear of Jean Pierre Bouchet is the father of both children. Catherine died in 1804 in Escou. Again, Marie Lassalle is the informant and there is no mention of Jean Pierre Bouchet or any other man as her husband. Jean Pierre Bouchet does a disappearing act just like Luc du Bie. Nor is there another male who steps in to raise Catherine’s son. Augustin was six years old and left parentless. The task of raising him fell to Marie. She was in her late 50s when she took him in. It seems that their must have been some confusion as to who Augustin’s parents were. As he was young when Catherine died, it may be that he referred to his grandmother as his mother. In some of Augustin’s records, I find Marie Lassalle listed as his mother, not Catherline Lassalle. Marie had to have a way to support herself, her daughter, and then later, her grandson. It was not uncommon for women in France to work in the late 1700s and early 1800s. In 1798, Marie was employed as a couturier, which is a seamstress. Marie died at the age of 70 on 11 Nov 1816. She lived her entire life in the town of Escou. 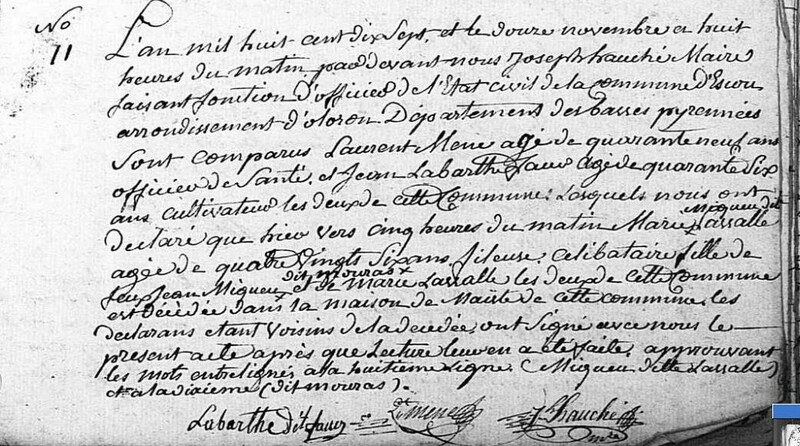 Her death certificate (seen below) makes no mention of Luc de Bie, as a widower or deceased spouse. Nor is there mention of another man as her spouse. Marie was a single mother who worked to support herself and her child. From what I’ve been told, the stigma that was associated with being unmarried with child in the 1800s and 1900s did not apply at this time and in this region. War and revolution may have changed attitudes. There may have been times when it was best not to have your associations, even in marriage, recorded in the official books. After she left motherhood behind, she found herself raising her grandson. Taking on a child in her 50s couldn’t have been easy. But, she outlasted many of her peers and lived through a revolution. What a strong woman she must have been!